One female flea can lay 50 eggs a day. With a host to feed on a flea can live as long as 100 days. Fleas are an intermediate host for tape worms therefore if your dog has fleas it is very likely to have tape worms. There are four stages in the life cycle of a flea: egg, larva, pupa, and adult. Fleas do not spend their whole time on the host. 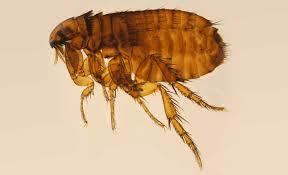 Approximately5% of a flea infestation is made up of adult fleas on your pet, leaving 95% in your home. Now we know a few facts about the flea it is easy to see how quickly one flea can turn into an infestation. Prevention is much better than cure and it can take several months to eradicate an infestation once you have one. There are several effective flea treatments available taking anywhere between 1 to 48 hours to kill fleas and they come in many different forms from spot on treatments to tablets, collars, sprays and powders. It is necessary to know exactly how each treatment works and how and when to apply them to ensure they are effective and always worth seeking advice from a vet or qualified person to get the right treatment for your pet. Also, some ingredients that are suitable for a dog will not be suitable for use on cats and can be extremely toxic for cats such as Permethrin. Once an effective treatment has been administered you may spot the fleas more easily as treatment work by acting on the flea nervous system therefore initially making them more active. Flea can not only cause immense irritation to you pet but also lead to anaemia with heavy infestations, secondary infections through bacteria and some dogs have severe reactions to flea bites (flea allergic dermatitis). Flea dirt appears as black specs near the skin of an animal. As this is digested blood by placing some on a damp white tissue you will see it turn a reddish brown colour. Referring back to the facts about fleas 95% of the flea infestation is in the environment so not only should your pets be treated but the house as well. To treat the house there are again many different treatments available from powders, foggers, bombs, wet sprays and aerosols. It is important to know a little bit more about the life cycle of fleas to know the best way treat the home. If you look for a treatment with (IGR’s) Insect Growth regulators in it will not only kill adult fleas but also prevent the egg stage from hatching and the lava stage from pupating therefore be an effective and quick way of breaking the cycle and getting rid of the problem. Once the life cycle has reach the pupa stage then nothing is effective and it must hatch to the adult stage to be killed. It is also important to know that the lava stage likes the dark and will go under sofa’s, beds and furniture and deep into the carpet pile or cracks in the floor, so you need to ensure you treat under furniture. ‘’One more fact. The highest concentrate of active ingredient is found in aerosols therefore making them the most effective so long as they also contain (IGR’S’). insect growth regulators. It will also help speed up the process of eradication if you hoover regularly and a good tip is to place a flea collar in the hoover and move all furniture as you hoover. Fleas hatch from the pupa into adults with the feeling of vibrations, so hoovering is an effective way of also breaking the cycle.